In late August I teamed up with the crew at the Prairie Summit Shop and wandered my way north for one of my most exciting summer weekends: an introductory course on white water canoeing. Unbeknownst to many, Saskatchewan has a fantastic white-water canoeing scene. Saskatchewan’s Precambrian shield is covered not only in the Boreal forest, but is also dotted with 100,000 lakes equating to 59,000 square kilometres of both still and moving water. The northern river systems also tell the stories of Aboriginal travel routes and the adventures of fur traders and voyageurs in the 19th and 20th centuries. Having spent a few weekends up north over the years with friends, I had only attempted multi-day canoe trips that required portaging past sets of rapids and waterfalls (portaging is when you carry your gear and canoe along a hiking path near a set of rapids or falls so you don’t have to canoe down them). A sucker for adventure, I knew I needed to learn the skills to one day be able to ride the rapids when possible, so I decided to invest in some training to help me acquire the necessary skills and knowledge. 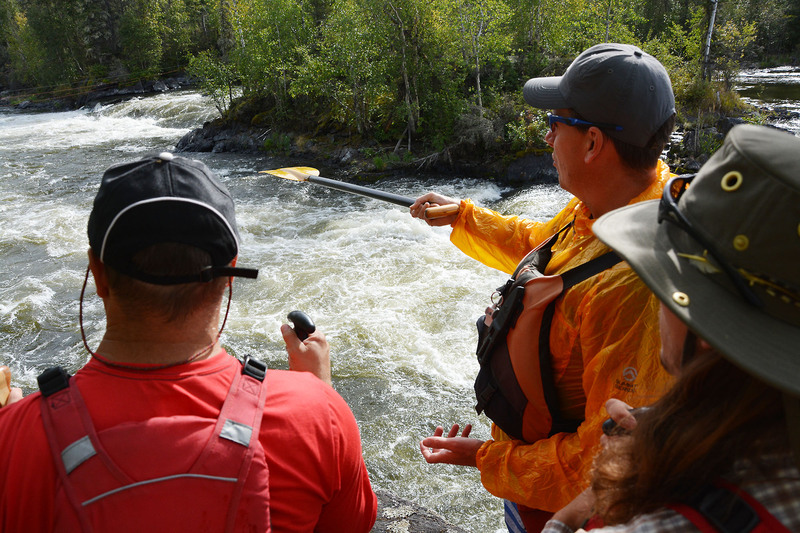 It was the perfect opportunity to sign up for The Prairie Summit Shop’s introduction to moving water course with the store’s owner, expert canoeist and Paddle Canada instructor, Geoff Horn. Driving up from my home in Saskatoon on Thursday night, I camped at the grounds in Missinipe, 85 kilometres north of La Ronge. 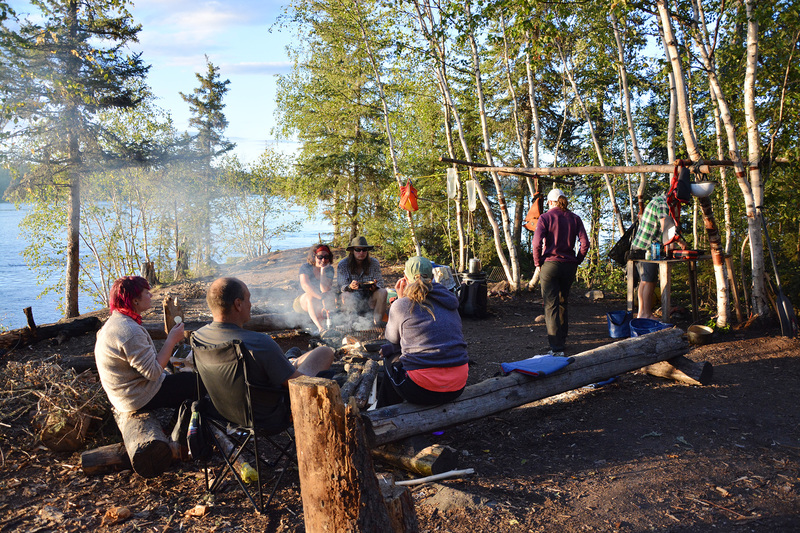 The next morning, I met up with a crew of seven other canoers at the dock on Devil Lake, 5 kilometres north of Missinipe. 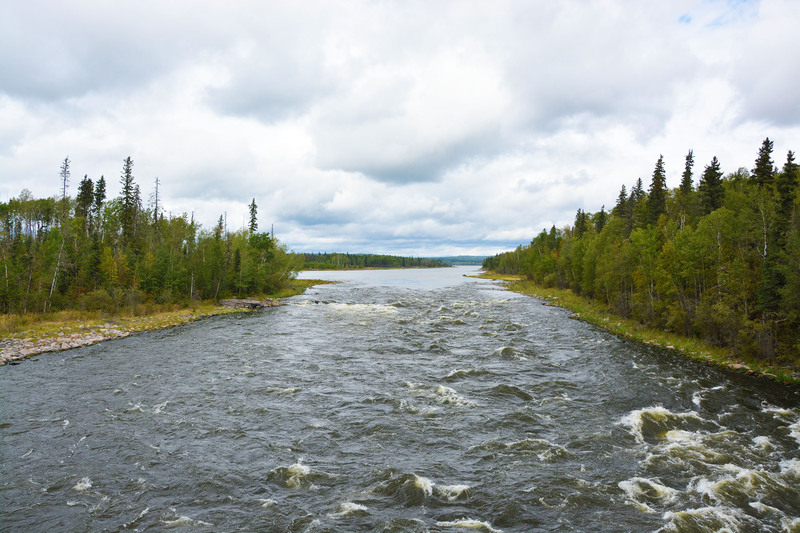 Devil Lake happens to be just past the mint green bridge over Otter Rapids, where all the water in the mighty Churchill River drains into a 600-metre-long gorge. 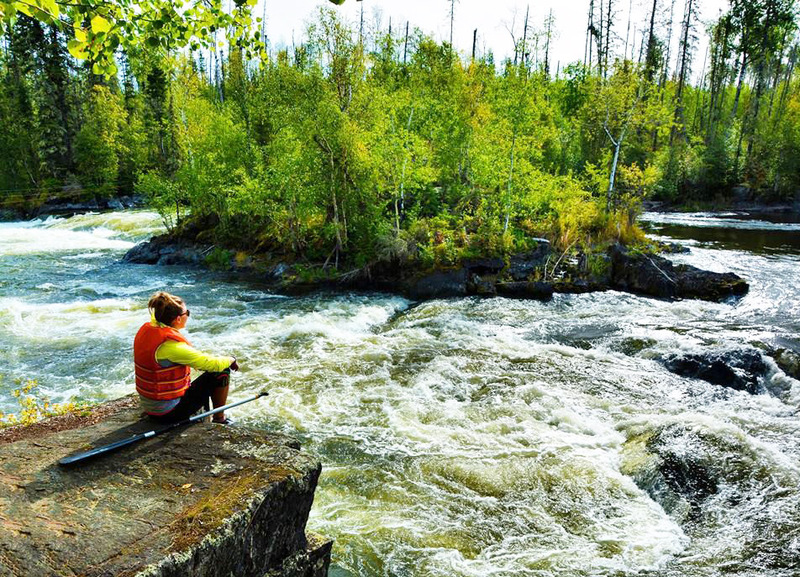 This is also a popular location where adventurous canoeists often play in the rapids, which can sometimes reach heights of more than two metres. Loading the canoes with our carefully wrapped and water-proofed gear for two nights of camping, we slid into the water and spent twenty minutes reviewing basic paddling strokes. The levels of expertise in our group ranged from those who have completed introductory flat water canoeing courses to others who frequently spend time canoeing throughout Canada. This is the type of course that’s excellent as a refresher or for those, like myself, who are entirely new to navigating white water. Paddling forty minutes across the lake we reached our campsite on Manitou Island before noon and spent the morning setting up camp. 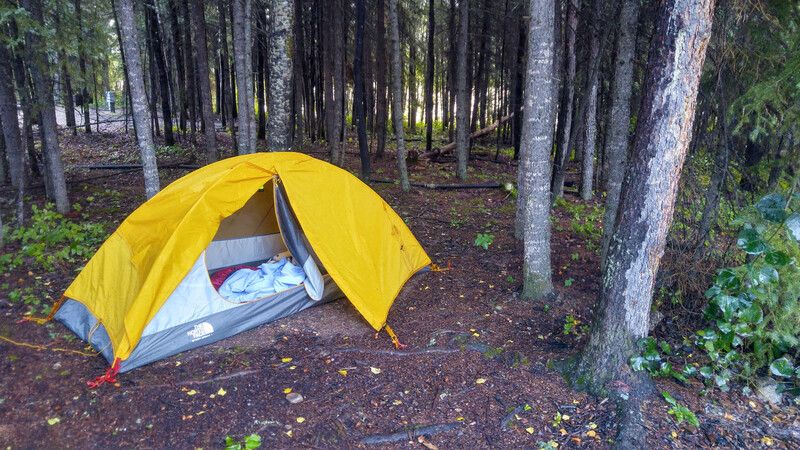 With plenty of space to pitch our tents amongst the jack pines and spruce trees, I set my one-man The North Face Stormbreak 1 tent up in a small clearing only 30 metres from the camp kitchen. I recently added a few light-weight purchases into my camping collection and was excited to try them out. After a quick lunch, (the Ukrainian came out in me and I grilled up some sausage and perogies) we paired up and climbed back into our canoes ready to learn the ins and outs of white water. The variety of maneuvers was surprising: hanging draws, high and low braces, sweeps, tilting, front ferrying, back ferrying and learning how to successfully steer in the stern or properly paddle in the bow and how to turn into eddys (an area where the water isn’t moving and is safe to paddle into). We played in some light current to practice the new strokes and I felt both challenged yet satisfied to learn something new. The best part of travel and adventure is putting yourself out of your comfort zone, turning the world into an interactive classroom and taking valuable knowledge away from the experience. Paddling back to our campsite that evening we cooked up our evening meals and chatted around the campfire about the skills we had learned. The next day we devoted the entire morning to reviewing each maneuver and practicing them in a variety of currents. We paddled up to Murray Rapids and Murray Falls to learn how to read the water and figure out what a potential route through the white water would be in our canoes. It’s not about riding the waves out of control, it’s about making calculated decisions based on pre-observation of the water on how to get through the churning water safely without swamping your canoe. At lunchtime, we stopped on a small island for a break. 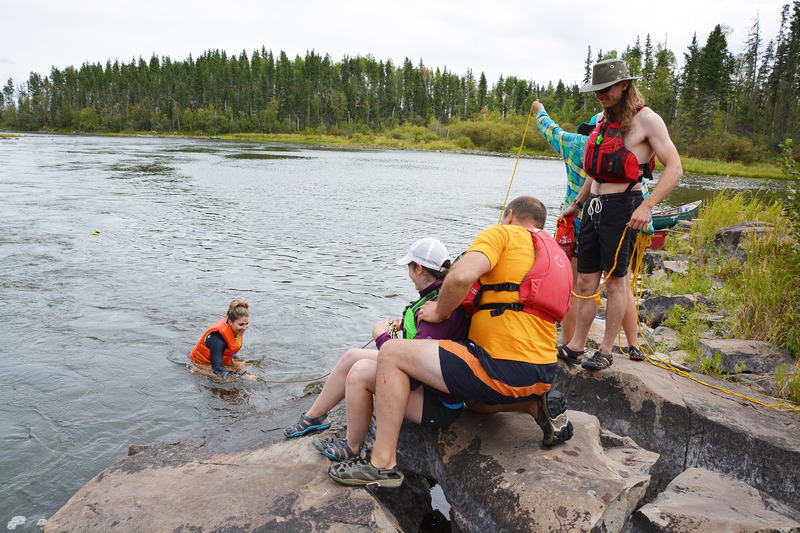 Afterwards, we each took turns hopping into the chilly northern Saskatchewan water to practice rescuing paddlers who had overturned in their canoes. Little did we know, this practice would shortly come in handy. There’s a certain thrill to entering white water and being prepared to react to the quickly changing situation as you’re being pushed downstream. My canoe partner and I also learned how important clear communication can be when deciding how to navigate the rapids. After our post-lunch rescue session, we all climbed back into our canoes and paddled into faster currents and bigger waves to work on ferrying across to the other side of the channel. Ferrying is moving from one side of the river to another with minimal downstream drift. The trick is to know your angles, read the situation and decide how to approach the different speeds of current going down the river to find success. I found it exciting how quickly currents can change and challenging to control the canoe to maneuver it through the water. Decisions need to be made quickly and confidently otherwise there is a very real potential of tipping. Which is exactly what happened as I tried to navigate myself and and my canoe partner through a particularly large set of rapids. Flipping a canoe full of camping gear and food would not be a fun experience but I admit I was pumping with adrenaline as my head popped above the surface of the water after having overturned on a particularly large wave. I was successfully still gripping my paddle and I searched for my canoe partner and the location of my canoe. We were both okay aside from the overturned canoe which was suctioned down into the water. It was exhilarating. Our instructor Geoff was quick to paddle over and help pop the canoe upright and stabilize it while we clambered in. We weren’t the only ones to tip and another group splashed into the water only moments later in the same waves. This was the perfect opportunity to experience a canoe tip, how to react and what to do in the event something like this happens in the future. As we were practicing in a safe environment, it was a great learning experience. Drying off in the bright afternoon sunshine as we paddled, we continued on to learn how to surf a wave in our canoe. There are certain types of waves that, if positioned perfectly in them, a canoe and its paddlers can ‘ride the wave’ like a surfer on a surfboard. One pair of paddlers were delightfully cheeky and snacked on a granola bar while surfing the wave. We ended the day by drifting through a narrow channel with plans to navigate the white water down Murray Rapids. We talked through our strategy of how to approach the rapids and the anticipation and excitement of successfully navigating them was intense. Paddle too far to the right and the potential to go through a set of waves and into a whirlpool and tip the canoe was possible. As my adrenaline spiked for the umpteenth time that day, my canoe partner and I managed to successfully navigate the moving water without dumping the canoe. 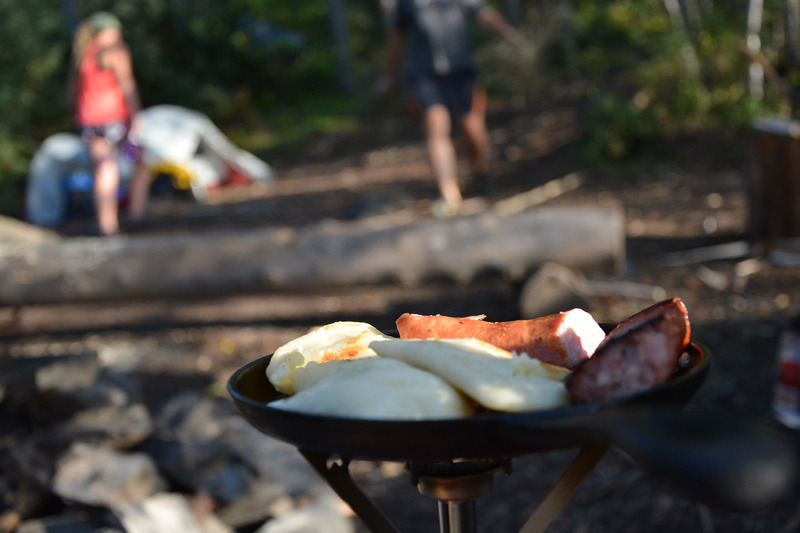 A perfect reason to celebrate that night over the campfire with another meal of perogies and sausage. It’s always surprising to see how much can be learned in a short amount of time and how well skills can be built by simply practising. 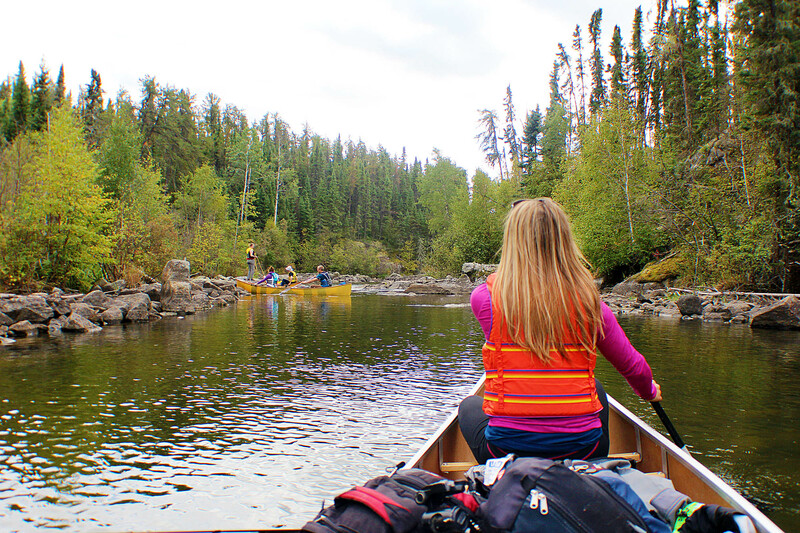 From the first day of reviewing basic paddling skills to comfortably assessing moving water to deciding which types of strokes will successfully help me navigate currents I think I’m ready for another white water canoeing adventure in northern Saskatchewan and cannot wait to plan a trip for next summer.